Hebden Bridge businesses have backed a Festival Fandango to boost trade this summer as they recover from the Boxing Day flood. The businesses were bought together by Hebden Bridge Arts Festival for their annual local business event - sponsored by local brewery Bridestones - to talk about how their week long programme this summer could help bring much needed custom into the town. She proposed that there should be a Festival Fandango running in June and July that could cover all the town’s big summer events and that idea was unanimously supported by the businesses. The festival’ s Artistic Director Helen Meller introduced their new chair Richard Green, and revealed that there will be two all day Street Sundae events during their second weekend, which was welcomed by the business owners who see the increased football from the free events featuring some of the nation’s best outdoor performers. Helen Baron is the co-owner of Ribbon Circus and her business was one those forced to close after the floodwater smashed its way down Market Street. Thanks to the generosity of her customers who have helped them renovate their premises they have now reopened, but Helen knows the boost the festival’s footfall has given the town’s traders over the last 21 years. 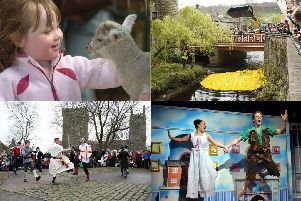 Helen Baron said: “I think the Arts Festival brings people into the town that don’t normally come. In a bigger sense the festival makes the town vibrant, exciting and an important place to come to because it has been going for so long, and is nationally recognised with so many great artists coming.